The Lawrence Lee Project began in earnest in the summer of 2009. 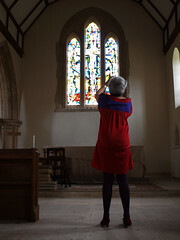 Stephen Lee (the elder of Lawrence’s two sons) and I had been to visit LSL’s windows at the Church of the Holy Cross in Binstead on the Isle of Wight several years before (possibly 2004 but we are not quite sure now). When I had become more conversant with digital photography (I’d been an dedicated film user until late 2004) we returned to have another go. And that was that. However, as Lawrence and his younger son Martin and family were moving house, many records, sketches and photographs (mostly slides) of his work over the decades, came out of the attic and into Stephen’s possession. That did it. The sheer quantity of information and images was crying out to be properly archived, documented and shared. And so we hatched a plan to visit as many of the windows as possible. In September 2009 we spent two full days in Surrey, during which time we visited nine churches (not counting those closed) and photographed 13 windows. We also, on that visit, met Pippa Martin – a former assistant of LSL who continues to work and lecture in glass, who has become a firm friend of the project (and of both of us). Two more outings have happened since then. In January 2010 we made a trip to Surrey, Kent and Sussex, taking in 9 churches, one cathedral and one school, and photographing 19 windows. 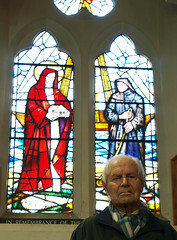 It was on this visit that I met Lawrence Lee and was delighted to be able to take him along to view one of his windows. In March 2010 Stephen and I met in London for a day and took in four of the guilds/companies of London, one church and another cathedral, photographing 9 further windows. In between these visits we also paid one-off visits to two more churches on the Isle of Wight (one only recently discovered), one in Portsmouth, and another I went to on my own in London while I was visiting a friend. That’s about 45 windows so far – and there are many many more to go! 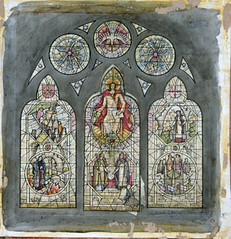 Sketch for the window at Southwark Cathedral (1959) showing Christ with a pair of compasses. The finished window shows a Madonna and Child. Alongside the new photographic collection, Stephen has been scanning LSL’s slides. 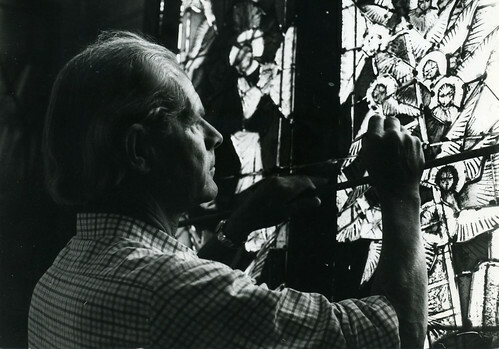 Most of these are of windows in progress or completed windows photographed in his studio. There are a few photographs of sketches too, and Stephen has also photographed some of these which are still kept at LSL’s home. In some cases there is information about a window, it’s theme or construction, and LSL’s description which sometimes accompanied a commission. For others there is nothing. Gradually, we are piecing together the older records with the new photographs and we hope to make as complete a document as is possible. It will be a long job, but it is very satisfying. If you are interested in following the project, please subscribe to the project’s own blog which documents all our major outings, and follow the Flickr group which exists to display photographs and to share information about LSL’s extensive and highly regarded work. This is interesting,I’ll look at it.